The next 19 February Royal Theater debut a new production from Idomeneo, King of Crete, coproduction with the Canadian Opera Company in Toronto and Teatro dell'Opera di Roma, which will be presented later. The opera, which will be staged until 1 March ─9 features double reparto─, It will be recorded for DVD release, broadcast live across Europe (Classical Radio and UER) and delayed by the TV channel Half. The sea, so brilliantly evoked in the instrumentation of Mozart, It is omnipresent in production, reinforcing the sense of rootlessness, soledad, insecurity or fear of characters. On shore the great themes of the opera develop, articulated from an illustrated version frenchified ridge XXIV Iliada in which Idomeneo, back to Crete after beating the Trojans, to save his life threatened by the raging sea, Neptune promises to sacrifice the first person he meets on shore, It will prove to be his own son Idamante. complex, painful and tense relationship between father and son, that beats throughout the opera, It is often compared to the then living Mozart himself, that their 25 years had left Salzburg and his father's house, composing much of the score in Munich, away from the yoke and protection of his father. In the late score that freedom and freshness, an infinity melodic invention and an orchestration filled findings and harmonic daring, despite corseted lie between two models ─ the Italian opera and francesa─ who lived in the troubled Europe at that time. Mozart masterfully connects the recitatives, with arias, set numbers and choral parts on a hinge score between two styles Ivor Bolton known depth and veteranía. The musical director of the Royal Theater, mozartiano governing its fourth title in front of the Titular Orchestra of the Teatro Real --after The Marriage of Figaro, The magic Flute Y Lucio Silla─ also he played Alceste, from Christoph Gluck, in 2014, with which Idomeneo finds many affinities, especially in the wonderful choral numbers, marches and orchestral interludes. Embody the double star quartet tenors Eric Cutler Y Jeremy Ovenden (Idomeneo), Y David Portillo Y Anicio Zorzi Giustiniani (Idamante); y las sopranos Anett Fritsch Y Sabina Puértolas (their), Y Eleonora Buratto Y Pleiades Sabirova (Elettra), which they will be accompanied by Benjamin Hulett Y Krystian Adam (Arbace), Oliver Johnston (The high priest of Neptune) Y Alexander Tsymbalyuk (Neptune's voice). Holder Choir prepared Teatro Real, as usual, by director Andrés Máspero, It has in Idomeneo a role of great dramatic and musical importance, performing some of the most beautiful pages mozartianas. 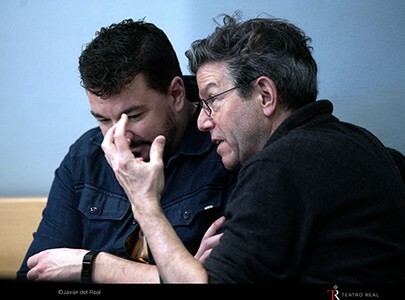 Idomeneo, King of Crete He offered at the Royal Theater in July 2008, in a co-production with Teatro Real La Scala in Milan and Paris National Opera, with musical direction Jesus Lopez Cobos and stage director Luc Bondy. Munich version then interpreted, from 1781, the role of Idamante, originally written for castrato, played by mezzo Bernarda Fink and Joyce DiDonato. This time one based version which will be offered rewrote Mozart, with substantial modifications, for Vienna, in 1786, the role of Idamante intended for a tenor, but regardless of arias and ballet Arbace, for the benefit of the dramaturgical coherence of the opera. Idomeneo Real returns to the conception of Robert Carsen, like a "Powerful anti-war statement, with a final full of hope: the possibility that a new generation brings love and peace and can transform a world wounded by the power, war and destruction ".